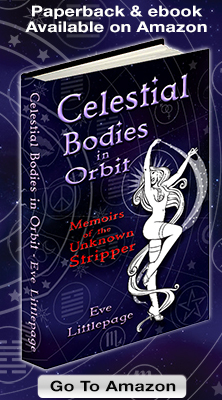 LAS VEGAS, May 31, 2016 /PRNewswire/ — Author Eve Littlepage (blog: https://www.evelittlepage.com/blog/ ) is donating her May and June royalties from CELESTIAL BODIES IN ORBIT: Memoirs of the Unknown Stripper to the Burlesque Hall of Fame (BHoF website: http://www.burlesquehall.com/ ). 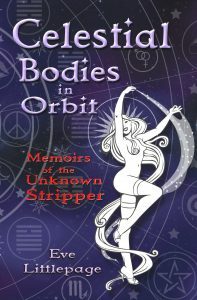 Celestial Bodies in Orbit is the author’s memoir of striptease dancing in the Boston area during the 1970s and 80s. She published it in 2012 after funding it through Kickstarter. Her story is laced with references to the I Ching, ghostly visitations, and spiritual epiphanies. It is also laced with references to, and celebrations of, Burlesque. In the process of publishing her book, Littlepage discovered the Burlesque Hall of Fame, and the rebirth of the art form as Neo-Burlesque. She wishes to support The BHoF in their efforts to preserve the past and serve up a new evolution of burlesque. The Burlesque Hall of Fame is a 501(c)(3) nonprofit museum, located at the corner of Fremont & 6th Streets in historic Downtown Las Vegas, with a mission to preserve, celebrate, and inspire the art of burlesque. The Burlesque Hall of Fame Weekend, is BHoF’s principal fundraising event, and takes place June 2-5, 2016 at The Orleans Hotel & Casino in Las Vegas. The weekend has grown from humble beginnings in the 1950s, when it was conceived by Burlesque Legend Jennie Lee, and nurtured by Dixie Evans and others into an elaborate extravaganza. The BHoF Weekend (http://bhofweekend.com/ is the longest-running burlesque event in the world: four days of flirty and fun Burly-Q events, including classes and performances from Legends and Neo-Burlesquers, so popular that it has a waiting list to attend this year. Littlepage says it is fitting to do a fundraiser to re-launch her memoir. 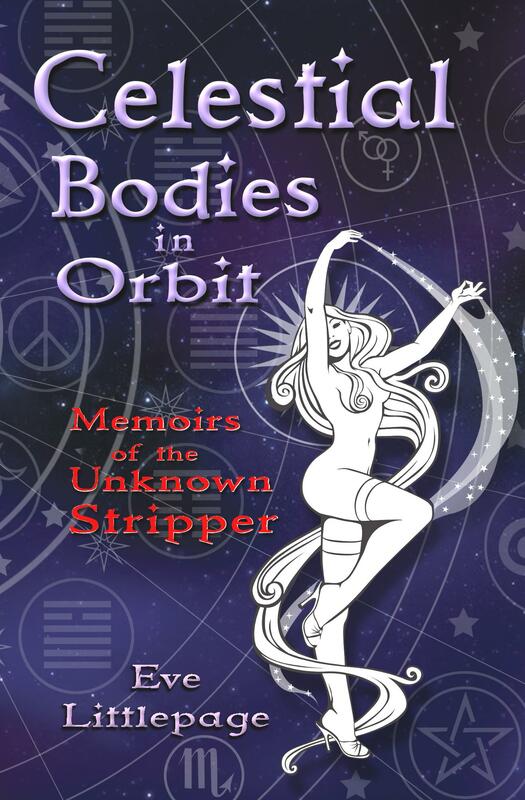 She has had a long history of volunteering and fundraising for non-profits, which began during her ‘Celestial Bodies in Orbit’ days. *(Purchases of her memoir are not tax-deductible for buyers, but the royalties Eve Littlepage gives to BHoF will be a charitable donation. Littlepage is also encouraging people to make a (tax-deductible)* donation to the Burlesque Hall Of Fame if they would prefer to support them directly. There is a donation link on their website. kredit von privatpersonen on The Light Returns! Happy Solstice!